This week The Royal Mint team have been transported back to the battle of Passchendaele, to commemorate a unique British hero. 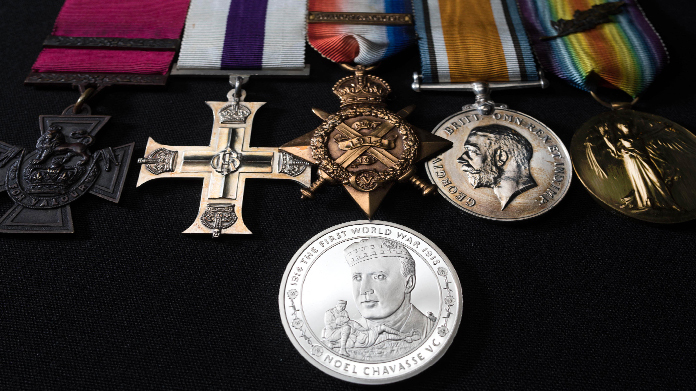 Noel Chavasse was the only British serviceman to be awarded the Victoria Cross twice during the First World War. Initially, for saving the lives of over 20 soldiers – tending their wounds under heavy fire during the battle of The Somme. Following this, Noel was posthumously awarded a bar to his VC for continuing to care for casualties at Passchendaele after being mortally wounded. With The Royal Mint striking a one off £5 coin in his honour, the team headed down to the Lord Ashcroft Gallery to get a selection of images of Noel’s impressive selection of medals alongside the coin. We then sold the images and Noel’s story into media to co-inside with the ‘Centenary of Passchendaele’ remembrance ceremony with amazing results. The media really appreciated a powerful, human story to accompany their coverage of the wider event. The Telegraph, The Daily Mirror and Daily Express featured excellent pieces in print and online while Sky and Yahoo (twice) also covered the news.